HATTIESBURG, Miss. (AP) — As the Leaf River rose north of Hattiesburg, Mississippi, 26-year-old Rebecca Bruce and her fiancé grabbed what they could and left the shed where they live. The water was more than 2 feet deep indoors when they left, she said. "We lost everything," Bruce said Saturday. "I've got a book bag full of dirty clothes, and I was lucky to get that." Bruce was among about 20 people in a Red Cross shelter in the Forrest County Community Center on Saturday, as creeks and rivers continued to rise after torrential rains pounded the Deep South. Downpours — part of a system affecting Louisiana, Mississippi, Arkansas, Tennessee and Alabama — submerged roads and cars, washed out bridges and forced residents to flee homes. At least three people have died in Louisiana alone. Mississippi officials were still looking for two missing fishermen, but had no reports of injuries or deaths, said Lee Smithson, head of the Mississippi Emergency Management Agency. 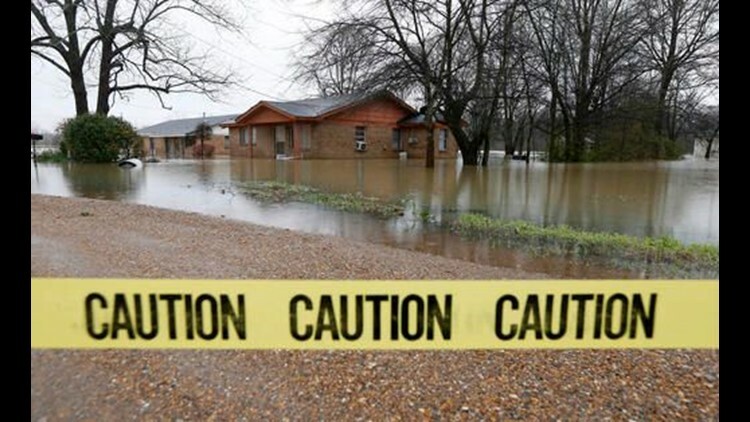 He said Mississippi is dealing with the most widespread flooding since Hurricane Isaac dumped more than two feet of rain throughout the state. However, he said, "It has not been quite as rough a day as we thought it was going to be today. ... It looks as if the significant rainstorms for the Mississippi Gulf Coast have not materialized." Officials had been afraid that as many as 1,000 homes might flood in Forrest County, where the Leaf River is expected to crest Sunday at 29.5 feet. But on Saturday, Smithson said, the number likely to be affected was looking more like 100 to 150. About 75 raised fishing camps in Pearl River County, across from Slidell, were likely to be surrounded by water, he said. It's the most widespread non-hurricane flooding the Louisiana National Guard has ever dealt with, said Col. Pete Schneider, a guard spokesman. He said about 1,000 soldiers and air crews were at work in 25 of Louisiana's 64 parishes. By Saturday morning, he said, National Guard crews in 160 high-water vehicles and 44 boats had rescued more than 2,100 people and nearly 190 pets. Others had given out 582,000 sandbags. Floods closed highways across north Louisiana, along its western edge and across the southeast, according to a map on the state Department of Transportation and Development website. "We have seen flood events in this state but never from one tip of the state to the next," Lt. Gov. Billy Nungesser told WDSU-TV. St. Tammany Parish officials late Friday asked people living near two rivers to consider evacuating because the rivers were rising to "historical proportions" because of heavy rains north of the area. In southwest Louisiana, a band of rain dumped 10 to 15 inches of rain across some areas late Thursday and into Friday, sparking vicious flash flooding. In northern Louisiana, the deluge has dumped 15 to 20 inches this week. In Ouachita Parish, well over 1,000 people have been evacuated, said Glenn Springfield, a spokesman for the sheriff's office. He said they started doing water rescues early Wednesday morning and have been "doing those pretty much around the clock nonstop since then." In Bossier Parish, also in northwest Louisiana, first responders evacuated at least 1,000 people. Officials Friday said they expect waters to overtop the Red Chute Levee but it's too soon to say by how much or what damage it could cause.